From Boyle Heights Loli & The Chones.....I got these songs from El Cochino, it was early home recordings....they were really a good band and live they were fun to watch...i miss them.. 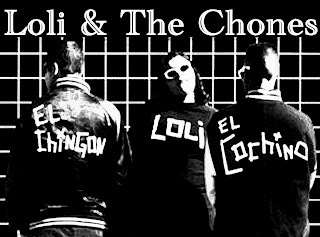 I remember seeing Loli & the Chones a bunch waaaay back in the day in LA...mid 90s I guess...I seem to remember them playing with the LA Times...whatever happened to them (L&TC, not the LAT)? Are they still playing music?